What happens when you're young and you have to move to a different place, far from home? 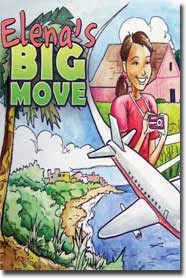 You could worry... or you could handle things like the young heroine in our reviewed book, Elena's Big Move. We received this book awhile ago, but one of the reasons why it took so long to review was because my kids liked it so much. So much.. that when we moved to our new home not long ago, it was packed up and mixed in with all the other books. This means #1 my kids liked it, and #2 the story was even more applicable for my family. While we didn't move from Puerto Rico to Indiana (like the girl in the book), we did move from the only home my children have ever known. The move was only two houses down, but it was a bit traumatic for them, nonetheless. The book, written from a woman who experienced her own move from Puerto Rico to Indiana, is available at Amazon and other book sellers. *A copy of the book was received for this review.